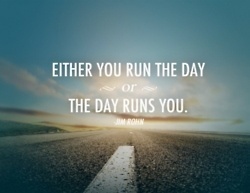 Monday Motivation: run the day | Fit Girl. Happy Girl. I love this for the beginning of the week because it’s so true! Either you run the day or the day will run you. Have a positive outlook for each day and you’ll be able to conquer it no problem :) What will you choose? Happy running! P.S. I found this on Pinterest. Follow my boards so you can find even more motivation!